B’nai Sholom Congregation was created from the merger of two Huntington, WV religious organizations: Ohev Sholom Congregation, 1887 and B’nai Israel Synagogue, 1910. These two organizations merged to become B’nai Sholom in 1975. Click here to download a copy of Our History. In 1872, Samuel and Dora (nee Eppinger) Gideon moved to Huntington from Cincinnati, Ohio. They became the first recorded members of the Jewish faith to settle in Huntington, which at that time had a population of about 4,000. As other members of the Jewish faith settled in Huntington in the late 1870s, they formed a religious/social organization called the Almonia Social Club. This club became the center of Jewish cultural life in Huntington in the 1870s. When Emanuel Biern settled in Huntington in the early 1880s, he and Samuel Gideon became close friends. In 1884, they decided to form a minyan for religious services according to Orthodox Jewish rites. This was the foundation on which Ohev Sholom would be built. Biern was the first lay reader and he and Gideon alternated in this capacity for a number of years. ln 1887, members of the Almonia Social Club, a group of 20 families, organized Ohev Sholom Temple (Lovers of Peace Congregation). The first Jewish religious school in Huntington was also established. (The spelling of the name would later be changed to Ohev Sholom.) In 1889, Ohev Sholom, as a distinct and separate organization from the Almonia Club, obtained a charter as a religious institution. Samuel Gideon became the first president and held that position for thirty years. The membership of the new Congregation consisted of Joseph Levy, Vice President; Edward Meyerson, Secretary; Leon Sternberger, Treasurer, Emanuel Biern, Louis Lefkowitch, Lee Kahn, Lester Kellner, Jacob Ziegler, Jacob Friedman, Benjamin Wolf, Mike Broh and Julius Broh (whose family continues today five generations later), Victor Greene and Moses Berkheim. In 1891, Ohev Sholom adopted the Reform Jewish ritual. 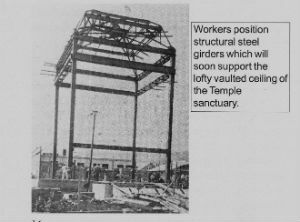 In that same year, construction began on the first Ohev Sholom Temple on the northeast corner of Fifth Avenue and Tenth Street on a lot purchased for $1200.00. In 1892 the first permanent home of Ohev Sholom Congregation was completed. The building was dedicated by Rabbi lsaac M. Wise, pioneer of Reform Judaism in the United States. From 1892 until 1915 the Congregation was unable to afford a rabbi. However, religious services were conducted on the Sabbath and on all the Holy Days with students from the Hebrew Union College assisting Gideon and Biern more or less regularly from 1908 to 1915. The Temple Sabbath School (religious school), was continued as a regular activity of the Congregation under the sponsorship and direction of the Ladies’ Hebrew Benevolent Society, precursor of today’s B’nai Sholom Sisterhood. By 1910, the recorded Jewish population of Huntington was about 150. Soon thereafter, Huntington experienced a surge in population growth, including new Jewish families. By 1917, the Jewish population had reached an estimated 310. It soon became apparent that Ohev Sholom had outgrown its first home on Fifth Avenue and Tenth Street. On November 1, 1919, Gideon and Biern negotiated the purchase of a lot on which the present B’nai Sholom Temple stands, (at Tenth Avenue and Tenth Street), and formulated plans for the erection of a new Temple. Dez C. Schonthal began a fund-raising drive. In 1924, he succeeded Samuel Gideon as president of the Congregation. Samuel Gideon’s death in 1923 served to emphasize that the advancing years of a majority of the original founders as well as a substantial number of the largest contributors to the building fund campaign would preclude their participation in the dream of a new and more commodious Temple unless immediate action was taken. As a result, the congregation pushed forward with the fund-raising campaign. On January 15, 1924, the old Temple at Fifth Avenue and Tenth Street was sold for $62,300.00. Construction of the present Temple at Tenth Avenue and Tenth Street began in 1925, shortly before the death of Emanuel Biern. The new house of worship for Ohev Sholom, (and the present home of B’nai Sholom), was designed by Meanor and Handloser, the preeminent design firm in the state at that time. 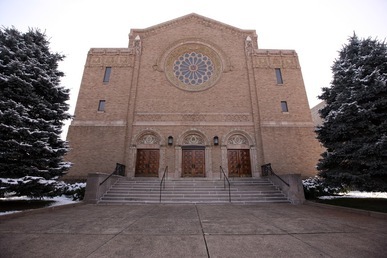 On June 11, 1926, the building was completed and dedicated, by Rabbi David Phillipson, President of the Hebrew Union College, assisted by the then Rabbi of the Congregation, Abraham Feinstein, and Rabbis Abba Hillel Silver and Samuel S. Mayerberg. Joseph Schonthal, (father of Dez C. Schonthal), donor of the pulpit and a generous contributor to the building fund, delivered an address at the dedication. With the stock market crash in 1929, many feared that the Temple would be lost, but members of the Congregation persuaded the mortgage holders not to foreclose. Given their difficult financial situation, the congregation could no longer afford the service of Rabbi Abraham Feinstein, who left to become a rabbi in Chattanooga, Tennessee. Student rabbis served the Congregation until 1939. By 1920, Ohev Sholom counted 60 families in its membership. The school had four teachers and thirty-one students and was meeting twice a week. The Jewish population of Huntington and the membership of Ohev Sholom continued to grow throughout the 1920s, 1930s and 1940s. By 1927, the Jewish population of Huntington was reported to be 1,125 in a community of 65,100. Through much of the 1930s, the Jewish population of Huntington hovered around 1,200, but began falling by the late 1930s and settled around 700. The Huntington Jewish community was very active throughout World War II. Thirty five members or sons of members of Ohev Sholom served during the war years. Three members gave their lives: Lt. Sidney M. Goldstein, Sgt. Raymond Schoenbaum, and Cpt. Teddy Solof. Ohev Sholom Temple was declared free of debt and was rededicated on September 17, 1943. The community continued to flourish, leading to the construction of a building for additional classrooms. In the 1950s, the Jewish population of Huntington again experienced a growth spurt. In 1951, the membership of Ohev Sholom stood at 165 families and by 1953 it had grown to 175. During the next several years, Ohev Sholom's membership stayed essentially flat, and numbered 166 families in 1957. There were approximately one-hundred children enrolled in the religious school, which had thirteen grades. As the children of the third generation of Jewish families grew up in Huntington, many stayed to build careers and lives there. Current members and supporters of B’nai Sholom who celebrated their Bar Mitzvahs at Ohev Sholom in the 1950s include Derek Hyman, Peter Levy, and Walter Lewis III. However, by the late 1960's, many of the young men and women of the fourth generation of the Huntington Jewish community, like many of their counterparts across the United States, followed a path different from that of their parents and grandparents. They began moving to the bigger cities—first Cincinnati, Pittsburgh, Louisville—then New York, Boston, Philadelphia, Chicago, and Los Angeles. They left Huntington to pursue careers, greater opportunities and richer lives. This reality combined with the reality of an aging congregation, led Ohev Sholom to feel the financial pinch of a dwindling membership. One clear sign was the merger of the religious school of Ohev Sholom with that of the B'nai Israel Synagogue. Finally, in the early 1970s, the Huntington Jewish community began to take steps to merge the two existing congregations: Ohev Sholom and B’nai Israel. As early as 1883 a small group of Huntington Jews made their first attempt to organize an Orthodox congregation, but their effort did not take definite shape until 1910. At that time B'nai Israel Synagogue was established under the leadership of Joseph Cohen, S.K. Hartz, Harry Brownstein, Samuel Gore, Albert Schlossberg, Harry Mazo, Samuel Glick, Harry Rose, Henry Angel, Max Pulverman, Emmanuel Biern, Jake Hermanson, Maurice Fetter and J. l. Elderman. The little congregation held its first religious services in Mickel's Hall on Third Avenue. Later this sturdy band of worshippers occupied the Odd Fellow's Hall on Third Avenue, and still later, rooms over the Fountain Drug Company and the Union Bank and Trust Company. However, the group was not content with this policy of renting a room. In 1920, the congregation began moving toward establishing a permanent house of worship. In addition to the men, the women of the congregation, organized as the Daughters of Israel in 1915, took an active role in raising funds. ln 1919, the congregation purchased its own cemetery in the Spring Hill section. Joseph Cohen led the purchase of additional property at the corners of 4th Street and 5th Avenue and 7th Street and 5th Avenue. The Congregation subsequently sold these properties. Finally the congregation purchased a lot on the corner of Ninth Street and Ninth Avenue. B'nai Israel Synagogue was built at this location in 1924. Some of the early members of the B’nai Israel Synagogue included Max Glick, Harry Brownstein, Charles Riter, Louis Lerner, Abe Moel, Samuel Sweig, Abe Frankel, Sol Masinter, Louis Kraft, Charles Solomon, Louis Leiner, Morris Rubin, l. T. Gross, David Gross, Hyman Gilbert, Abraham Lieberman, Benjamin Dushman, Paul Kirsh, Morris Boos, Louis Gaffin, and J. l. Elderman. During the presidency of Sol Masinter, the burning of the mortgage took place. On December 3, 1939, at the mortgage burning program, a number of members extended greetings: Samuel Samson, President of Ohev Sholom Temple; Mrs. Eph Broh, President of Sisterhood; Mrs. L. Kraft, President of Daughters of Israel; Mrs. H. Brownstein, sponsor of Hadassah; lsador Cohen, President of B'nai Brith, and Sol Ribakoff, sponsor of A.Z.A. Samuel Gore, one of the founders of the Congregation, initially led services. Samuel Mandel became B’nai Israel’s first permanent rabbi in 1913. He served until 1919, when he died unexpectedly at the age of 38. B’nai Israel, early in its existence, was committed to providing the facilities and personnel to give its children a Jewish education. The Hebrew School was always an integral part of the synagogue. In 1957, the Hebrew School had fifteen students and the religious school had forty eight. As the congregation grew, the need for expanded classrooms became clear. First the Congregation purchased a house adjacent to the synagogue and converted it into classrooms. Although the house caused concern as a fire hazard due to poor heating and ventilation, it proved to be adequate for a time. But early on the Congregation concluded that they needed a better facility and planned and constructed a new education building. In 1968, however, as the Congregation had aged and the number of children declined, the Religious Schools of B'nai Israel Synagogue and Ohev Sholom Temple merged. Until 1978, the merged religious schools met in alternate years in one building or the other. In 1920, when efforts to build the permanent house of worship for B’nai Israel began, the Congregation’s membership numbered about fifty families. By 1957, the membership had grown to about one hundred twenty five families. There were instances of dual membership as well. Over the years, B’nai Israel migrated from the Orthodox Jewish practice to the more moderate Conservative Jewish practice. However, this practice continued to differ significantly from the Reform Jewish theology of Ohev Sholom. As was the case at Ohev Sholom, the children of third generation Jewish families celebrated their Bar and Bat Mitzvahs in Huntington. Current members and supporters of B’nai Sholom who celebrated their journey into Jewish adulthood at B’nai Israel included Mark Brodof, Lee Colker, Matt Colker, Herman Glaser, Norman Glaser, David Glick, Billy Glick, Allen Kaplan, Norty Kaplan, and Judy (Radow) Woodruff. These Jewish natives of Huntington built their careers and lives here. Many of their friends at B'nai Israel, just like their counterparts at Ohev Sholom, left Huntington in the late 1960s and 1970s and built their careers and lives elsewhere, across the United States. The membership of B'nai Israel steadily declined throughout the 1960s and 1970s and the Congregation, too, began to feel the financial pinch. In the early 1970s, neither Ohev Sholom nor B’nai Israel had a permanent rabbi. At the same time, as their memberships dwindled, the Boards of Trustees of both congregations struggled with the increasing financial burden of maintaining their physical facility, religious school, and retaining the services of a rabbi. The two congregations began discussing a merger. One of their first agreements was to hire a single rabbi to serve both congregations. Phillip Aronson served in this capacity between 1972 and 1975. Continued merger discussions led to the adoption of Articles of Merger by both congregations in 1974. Under the Articles, a single congregation, to be named B'nai Sholom Congregation, would be formed. The ritual practices of B'nai Sholom would primarily follow the practices of Reform Judaism at Friday night Shabbat service; Conservative Judaic practice would prevail at Saturday morning Shabbat service and Sunday morning weekday service. The merger officially took place in the spring of I974. For several years after the merger, services alternated between the facilities at Tenth Avenue and Tenth Street and Ninth Avenue and Ninth Sheet, but one of the agreements of the merger was to consolidate worship in one facility. As a result, the decision was made to consolidate all congregational activities in the Ohev Sholom building at Tenth Avenue and Tenth Street. This was a practical decision in that Ohev Sholom was larger and provided more amenities. In the spirit of compromise that characterized the merger, the beautiful historic windows and a replica of the ark from B'nai Israel were installed in the small sanctuary added to B'nai Sholom. That chapel, located so congregants face east in prayer, is used for smaller special religious events, summer services when attendance is typically smaller, and the regular more Conservative oriented Saturday and Sunday services. The merged Congregation sold the former B'nai Israel building and placed the proceeds into a capital preservation fund to meet future financial needs of B'nai Sholom. Frederick Wenger, who served until 1982, was B'nai Sholom's first rabbi. Upon his departure, Stephen Wylen became B'nai Sholom’s rabbi, and served until 1987. From 1987 until 1989, B'nai Sholom did not have a permanent rabbi, employing instead the services of student rabbis from Hebrew Union College in Cincinnati. In 1990, David Wucher and his wife Tori returned to Huntington and B'nai Sholom, the site of their 1975 marriage. He became B'nai Sholom's new rabbi and served until his retirement in 2011. Rabbi Jean Eglinton serves as the current rabbi of B’nai Sholom. She was ordained at Hebrew Union College in Cincinnati. During the decade following the merger, the Jewish population of Huntington experienced a healthy revival, largely spurred by the growth of Marshall University and the opening of their School of Medicine in 1976. In addition, when Temple Agudath Achim in nearby Ashland, Kentucky, closed because of declining membership, their remaining congregants came to Huntington to worship at B’nai Sholom. In the 1970s, the B’nai Sholom religious school operated under the watchful guidance of Director Joan Lerner and received support from the B’nai Sholom Sisterhood. Many of the new arrivals to Huntington in the 1970s and 1980s were young couples with growing families. The religious school grew as a result. At its peak during this period, school enrollment approached seventy students. The number today is significantly less. (At left: B’nai Sholom, 10th Avenue and Tenth Street, today) Despite the influx of new families in the 1970s, at the same time an exodus of young adults of the Jewish community began and continues to this day. Older members of the B'nai Sholom family have retired and moved either to warmer climates or to be closer to their children and grandchildren. Additionally, there have been deaths of older members. This combination of factors has outweighed the positive impact of new arrivals, and membership of B’nai Sholom continues to decline to this day. Despite declining membership and dwindling financial resources, the spirit of B’nai Sholom is strong. Our Congregation is blessed with members who are committed to B’nai Sholom’s financial and spiritual health. The hope is that our Congregation, building on its rich and proud history, will continue to represent a strong Jewish spiritual and communal presence in the city of Huntington for many generations to come.